In our previous March 13th update, we pointed out that the S&P 500 (SPX) had risen by 228 points or 9% since January 9th-10th, which is when our Asbury 6 key internal market metrics and Correction Protection Model CPM) both switched back to a positive. “Risk On” status, but most recently had declined to test primary underlying support at 2752 to 2739 on March 8th. The chart below shows that SPX has since quickly rebounded from 2752 to 2739 support, back above overhead resistance at 2800 to 2817, and is actually setting new 2019 rally highs as of today. 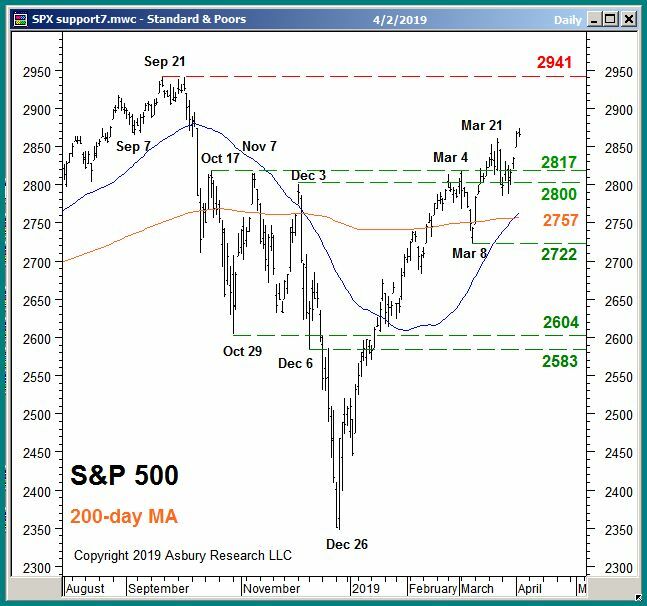 This clears the way for continued strength and a potential retest of the broad market index’s September 2018 all-time high of 2941, as the 2817 to 2800 area now becomes underlying support. Meanwhile, the table below shows that our Asbury 6 key stock market internals have all turned back to positive as of April 1st, after being split between positive and negative signals since March 13th — which is exactly when SPX started stalling at the 2800 to 2817 overhead resistance area from below. There are also a few red flag on the horizon this quarter, among them too-bullish investor sentiment and a 60-year seasonal tendency for the S&P 500 to peak for the year during April. However, as long as our key market internals remain positive, our bias will remain cautiously bullish on US stocks as it has since the beginning of the year. The video, available below, shows how we have actually managed investor assets amid these recent market conditions for our Asbury Research Management clients. which explains how we have recently utilized Asbury Research’s market analysis and investment ideas to professionally manage client portfolios. We offer a unique approach to investment management that is dynamic and based on the current condition and risk/reward profile of the financial markets, rather than on whatever your pre-established investment allocation might be. Our portfolio team monitors the current condition of global financial markets every day, as it pertains to your account, and alters our tactical and strategic investment approach as market conditions change. This communication is for informational purposes only. It is not intended as investment advice, or as an offer or solicitation for the purchase or sale of any financial asset. No inferences may be made and no guarantees of profitability are being stated by Asbury Research LLC. The risk of loss trading in financial assets can be substantial. Therefore, you should therefore carefully consider whether such trading is suitable for you in light of your financial condition.